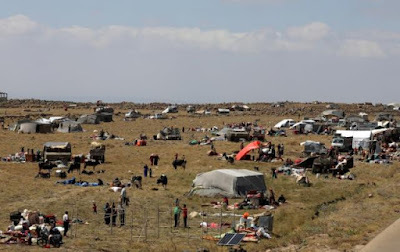 Accompanied by a major Russian aerial bombing campaign that has led to some of the fastest mass displacements of the war, Syrian pro-government forces have marched swiftly into insurgent territory in Deraa province over the past two weeks. Spokesman Ibrahim al Jabawi said the rebels had carried to the negotiating table their “response to a list of Russian demands” that include the handing over of weapons and settling the status of rebels in a deal that ends the fighting. “Today they are carrying their response to the terms presented by the Russian officers,” Jabawi said. The Russian demands, handed to rebels in a meeting in a town in southern Syria on Saturday, had prompted a walkout by the rebels, who said the terms amounted to a humiliating surrender. The opposition team was then persuaded by Jordan to go back to the negotiating table, diplomatic sources said. Jordan has been working behind the scenes to spare more bloodshed and destruction to a region whose future stability is crucial to the kingdom’s own security. 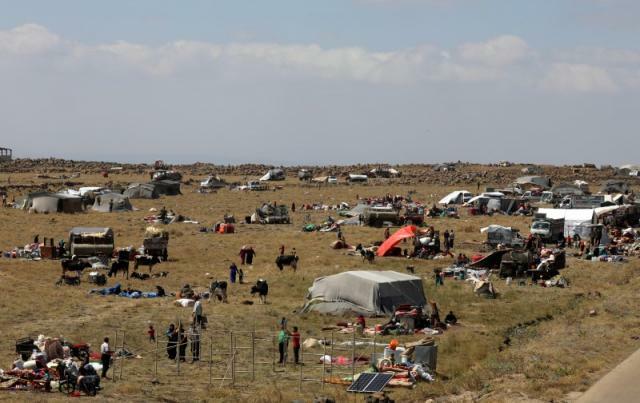 The arrival of thousands of uprooted Syrians among the tens of thousands near Jordan’s border has created new security challenges and a humanitarian nightmare for the authorities. Jordan’s Foreign Minister Ayman Safadi plans talks on Wednesday with his Russian counterpart Sergei Lavrov about how to implement the broad terms of a settlement in southern Syria after rebels surrender their arms, a diplomatic source said. “Time to discuss possible steps to improve it,” the Swedish U.N. mission posted on Twitter. The opposition negotiators have returned to the table with an expanded 12-strong delegation that will now also tackle the fate of rebel factions in the Quneitra province further west near the Israeli occupied Golan Heights, Jabawi said. Previously they were negotiating for Deraa province to the east. “A new expanded negotiating committee that represents all the south has been formed to reach an agreement to spare innocent lives and ensure the safety of civilians and fighters,” said a statement by the central operations room in the south, representing the key rebel factions in that region. The new team will seek to overcome opposition rifts over the Russian demands, after some negotiators said they wanted to continue the fighting and accused some rebel commanders of treason by cutting separate deals with the Russian military. Rebels and residents say a string of rebel towns have reached their own surrender arrangements that have allowed Russian military police to enter and patrol their towns. They hope unifying their ranks will improve their bargaining stance and get guarantees of a bigger role by Russian military police in their towns to keep at bay Syrian security forces and foreign Shi’ite militias they say are fighting with the army. In the major rebel stronghold of Busra al Sham, a powerful military commander who was a negotiator broke ranks with his team and began handing over weapons before reaching a deal. The opposition will also seek Jordan’s support in getting amnesties for thousands of former army defectors who prefer to stay in the area while offering safe passage for those who do not want to make peace with the authorities. Many Syrians who rose against President Bashar al Assad’s rule will find it difficult to accept state authority after years of war and would always have fear of retribution.